May 14, 2018 -- Combining fluciclovine-PET and multiparametric MRI potentially can better detect and classify high-risk prostate cancer than the two modalities alone, according to a Norwegian study published in the May issue of the Journal of Nuclear Medicine. The key to the hybrid modality's efficacy is the addition of the PET tracer and also incorporating T2-weighted MRI and diffusion-weighted MR imaging (DWI-MRI) to advance the ability to distinguish between malignant and benign tissue and high-grade tumors from other tissue. Images show a central slice (left) through tumor probability map of a 64-year-old patient, fused with T2-weighted MR image for anatomic reference. Region with highest tumor probability values (right) correspond to peripheral-zone tumor with Gleason score of 4 + 4, as verified by histopathology. Images courtesy of Journal of Nuclear Medicine. "We found that when we combined the information from multiparametric MRI and fluciclovine-PET, we were better able to distinguish tumors from other tissue than using only multiparametric MRI or only fluciclovine-PET," said lead author Mattijs Elschot, a researcher at the Norwegian University of Science and Technology in Trondheim. "We believe these results are a good example of the versatility and complementarity of prostate PET/MRI." Both the European Medicines Agency (EMA) and the U.S. Food and Drug Administration (FDA) have approved the PET radiotracer fluciclovine for detecting recurrent prostate cancer in patients with biochemical relapse after initial treatment. Fluciclovine is marketed as Axumin by Blue Earth Diagnostics. Needless to say, radiology can play a critical role in diagnosing the disease, given that it is the most frequently detected type of cancer among men in developed countries. "In Norway, all men suspected of prostate cancer based on elevated prostate-specific antigen (PSA) levels undergo multiparametric MRI before prostate biopsy as part of the integrated prostate cancer care pathway of the Norwegian Health Directorate," Elschot wrote in an email to AuntMinnieEurope.com. He and his colleagues are well-versed in the efficacy of fluciclovine-PET/MRI for prostate cancer evaluation. The current paper follows a January 2018 study in which the researchers found the contrast-enhanced hybrid modality achieved "high specificity but low sensitivity for detection of lymph node metastases in high-risk prostate cancer patients." In addition, a positive fluciclovine-PET/MRI scan for lymph node metastases was indicative of a "higher metastatic burden compared with a negative scan" (European Radiology, 2 January 2018). "We started this study to find out whether adding fluciclovine-PET to multiparametric MRI exams could improve the sensitivity for detecting lymph node metastases, which is currently a challenging task," Elschot said. The current study included 28 patients (median age 66, range 55 to 72). The subjects recorded a median PSA level of 14.6 ng/mL (range, 3.7 to 56.9 ng/mL), a median biopsy Gleason score of 8 (range, 7 to 9), and a clinical stage of prostate cancer that ranged from cT2b to cT3b (JNM, May 2018, Vol. 59:5, pp. 762-768). Patients underwent a simultaneous PET/MRI exam, which featured a 3-tesla scanner (Biograph mMR, Siemens Healthineers) prior to surgery. The multiparametric MR imaging protocol included T2-weighted, DWI, and dynamic contrast-enhanced (DCE) sequences for tumor (T) staging. The median administered dose of fluciclovine was 327 MBq (range, 283 to 384 MBq). The researchers then selected a final cohort of 119 delineated volumes of interest (VOIs) from T2-weighted images. VOIs covered prostate tumors, benign prostatic hyperplasia nodules, prostatitis, and healthy tissue using histology as the reference standard. They then performed an area under the receiver operating characteristic curve (AUC) analysis to evaluate the efficacy of fluciclovine-PET, MRI, and the two modalities combined. In reviewing the trio of modality options, the researchers found PET/MRI outperformed MRI and PET alone for distinguishing tumors from benign tissue and differentiating high-grade tumors from other tissue. 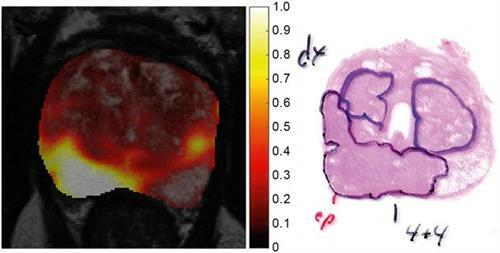 "The MR images provide excellent soft-tissue contrast and information related to diffusion and perfusion processes in the tumor, whereas the fluciclovine-PET images reflect the uptake of amino acids by the cancer cells," Elschot said. T2-weighted MRI, diffusion-weighted MRI, and PET features performed similarly to PET/MRI in differentiating between tumors and their grades. The results "suggest that for the quantitative analysis performed in this study, DCE MRI does not add much value to PET, T2-weighted-MRI, or DWI-MRI," the authors wrote in the study. Given the small study sample of 28 high-risk prostate cancer patients, Elschot said it is too soon to adjust routine clinical protocols based on the findings, and more research is needed to validate the results. "Furthermore, PET/MRI is more expensive than MRI alone, so we cannot expect that every man with elevated PSA will get this scan as part of routine clinical practice," he added. "However, we do foresee that PET/MRI could become an important tool for diagnosing the more difficult cases, such as planning of targeted prostate biopsies in patients who are highly suspected of having prostate cancer but where no cancer was found in initial biopsies." Elschot and colleagues recently completed a larger study investigating the potential of combined fluciclovine-PET/MRI for diagnosis of recurrent prostate cancer. They plan to present those results soon. In addition, another group of researchers at the Norwegian University of Science and Technology currently is investigating fluciclovine-PET/MRI to guide brain tumor surgery.